I review TONS of websites, y’all. Sometimes I do it for free in Facebook groups, sometimes people pay me just for a video review, sometimes I do it for potential clients who are interested in working with me – and sometimes I do it just because I LOVE to do it! But whatever the reason, I notice the same mistakes on these websites over and over again. They’re so common I had to talk about them. So here we go. The number one mistake I see on home pages is CTA confusion. So let’s clear that up right now. Every single home page must have at least one CTA (that’s Call to Action, in case you were wondering). If you don’t have a CTA on your home page, you’re wasting everyone’s time. Harsh? Maybe. But if you’re not actively telling your visitor what to do, they have to figure it out for themselves. That may mean they venture over to your about page but never your services page. Or maybe they close out of your site altogether because it didn’t interest them. Maybe you’re reading this smiling smugly because you have more than one CTA on your home page. In fact, you have dozens of them! Because if one is good, 12 are better, right? Having too many CTAs is just as bad as not having any at all. If you have 12 CTAs, then your visitor is going to be overwhelmed. You’re asking them to visit your services page, read your blog, sign up for you newsletter, share you FB page, join your FB group, follow you on Instagram, check out your Pinterest profile...aren’t you confused by now? Instead, choose the top 3 CTAs you want to have. That usually includes some sort of opt-in form, a link to contact you, and a link to your services page. Of course, that varies based on your business and industry. But for most of my clients, that covers it. You could do up to 5 if you have a long home page, but remember: go for impact, not overwhelm. I’ve reviewed too many home pages that ramble on for paragraphs and NEVER mention what the person actually does or offers. This is super typical for solopreneurs who write their own copy because what they do is so much a part of who they are, they don’t think to spell it out on the screen. But guess what? The goal is to have people who don’t know you come to your website, right? So even though you know you are a badass money coach or an amazing stylist, that person who stumbled onto your site might not. So while you go on and on about how you help people get their groove back or create a budget they can stick to, they’re wondering what exactly that means. 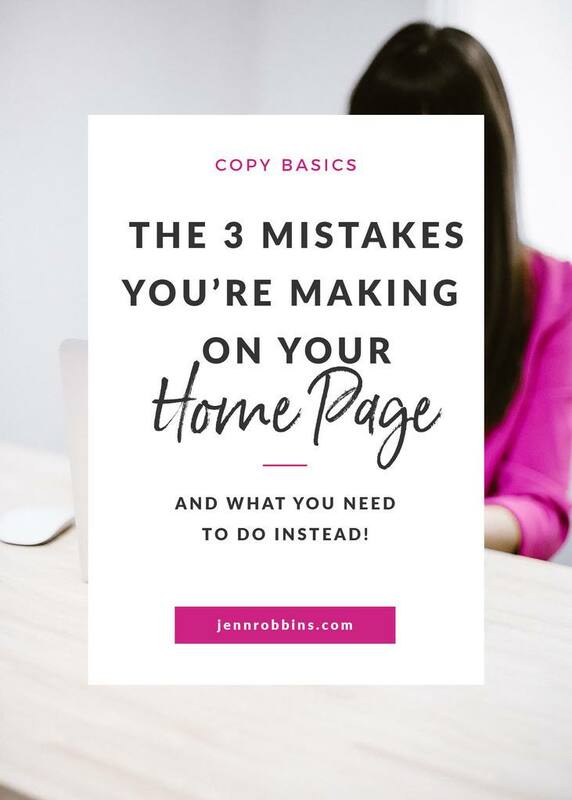 If you’re a solopreneur, your home page should have some version of this: I’m Jennifer, and I’m a conversion copywriter. Wait a minute, Jennifer. You JUST told me to talk about myself, and now you’re saying I shouldn’t be the focus. What gives? The thing is, your website isn’t really about you. Yes, you should clearly state who you are and what you do. Yes, you should tell us a little about who you are, why you’re the right person for me, and what kind of work you do. But all of that should be with the focus on your ideal client. There should be very little “I” language in your copy. Too many websites are filled with sentences like “I help clients with managing their Pinterest accounts” or “I decided to become a birth photographer after falling in love with the beauty of birth”. There’s nothing necessarily wrong with either of those, except that starting sentences with “I” is going to cause your reader to skip over those. Humans are inherently selfish. We want to know what’s in it for us! Focus on the reader, your ideal client. Use “you” language instead. Talk directly to the person reading the copy on your site. Lure them in by appealing to their pain points. Cut all the “I” sentences you can, or rewrite them with “you” in mind. Now, you know you want to go back and review your home page with fresh eyes, right? See if you’re making any of these mistakes. And if you are, it’s time to update that copy! By now you’ve explored the competition, ​your soulmates, and your ideal audience. It’s time to start creating content! But first you need some ideas. 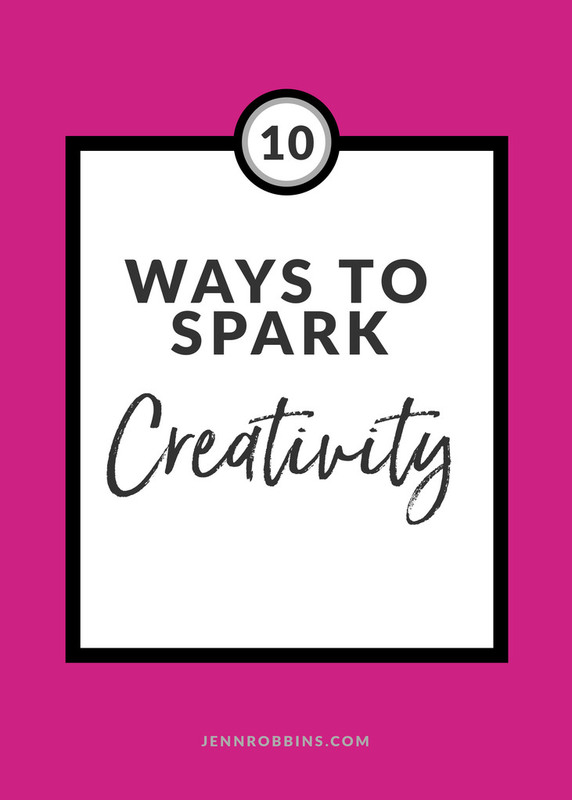 It’s time to spark your creativity. How do you get started? Well, if you didn’t look closely at your influencers content, go back and take a look. It will help you get an idea of what others in your industry are creating. Now let’s be crystal clear: do NOT copy what they are doing! That is NEVER ok. However, you can look to them for inspiration. Do you love the way they have their content organized? Or maybe you love their easy light voice? Whatever it is that draws you in, think about how you can incorporate that in your business, but in a way that is entirely you. Even great artists are inspired by others, but they only use that inspiration as a jumping off point to discover their own genius. That’s what you’re going to do, right? Awesome. Now it’s time to get to the hard work: actually creating content. Some people love creating content but others absolutely despise it. That’s ok. You don’t have to create content if you don’t want to; you can totally hire that out to someone like me. But your business does need a steady stream of content creation. Looking to others for inspiration is one way to get started. We’ve created a free download for you to spark creativity and get the ideas flowing. Those 10 ideas should give you a great head start. But if you find yourself still struggling, reach out for help. I'd love to get you started with some fabulous content ideas with a Power Hour session. Before you start actually creating content, it’s a good idea to check out the competition. Now don’t get intimidated when we say competition. This isn’t a war or even some heated sports rivalry. But in business you will have competitors. Your brand soulmates may even be part of the competition! That’s totally ok. In fact, it can be good to be friends with the competition. Why? You’re going through the same thing! And while you may be in the same business, odds are that your ideal audience isn’t exactly the same. You may offer the same services, but you are totally different brands. You may be attracting more creative clients while your competition sings the siren song for tech start-ups. They likely aren’t going to steal your clients – or vice versa. 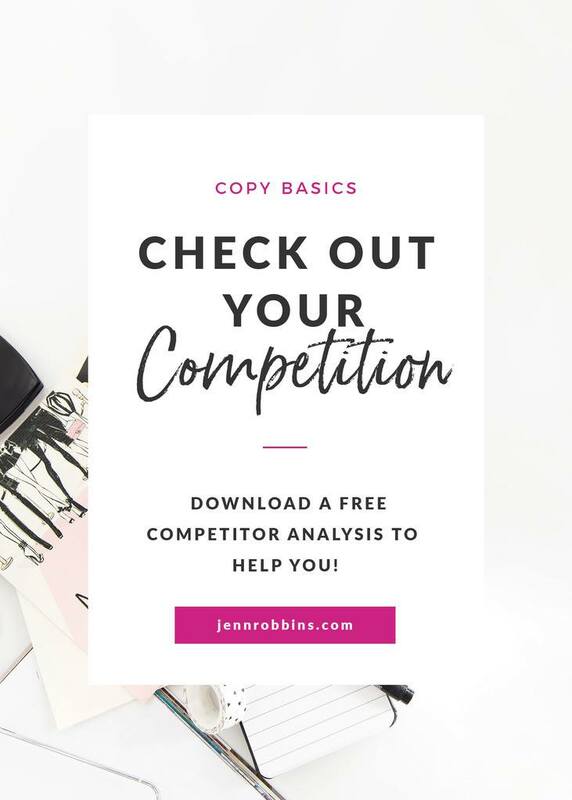 Whether you’re friends with the competition or not, sit down and pick 3 potential competitors to complete the Competitor Analysis for. Print an Analysis for each competitor and fill out accordingly. You’ll want to note what service they provide, what social media channels they use, how often they post, how big their audience is, and what is their most popular content. Next evaluate their strengths and weaknesses. What are they completely rocking, and where are they struggling? Next look at what makes them unique. Is there an attribute that makes them stand out? For example, I was looking to order some flowers for a friend’s birthday and stumbled on this amazing florist who has some incredible copy. If I was a florist and filling out this worksheet, I would definitely put that down as something that made them unique! Does your competitor have a list builder opt-in? What is it and does it make you want sign up? And finally, what are their best ideas? Do you like how their services are set up? Do they have an amazing blog series? Write it down. Once you’ve filled out your worksheet for each competitor, compare them. What do they have in common? What separates them from each other? What do you like and dislike about each one? From this analysis you may learn what kind of content you want to create – or on the flip side, what kind of content you want to stay away from! It is important to remind you here: you are just looking to them for inspiration and as a guide for what is standard in your industry. You should never copy your competitor. Not only is it unethical and often illegal, it is always a bad idea. Their ideas work for them because of who they are! You need to find what works for you. Before you leave the idea of competition, look at the three brands you picked. If any of them really stand out to you, reach out to them. 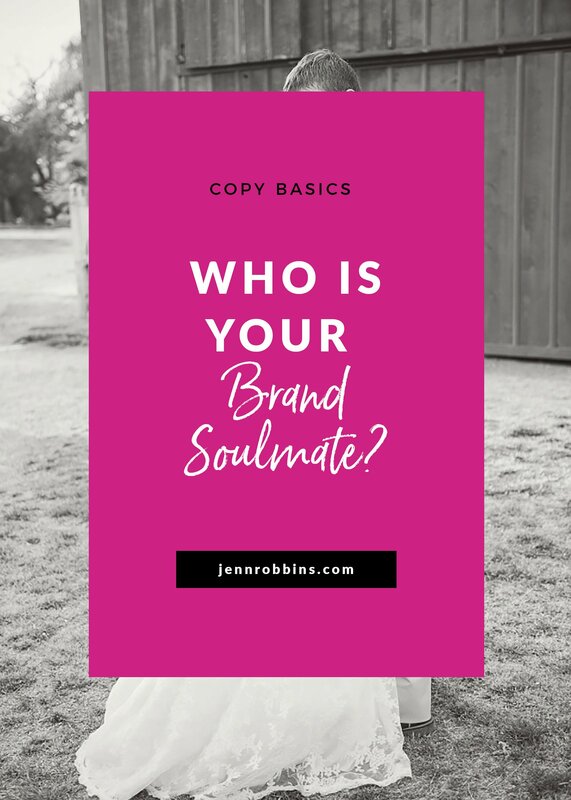 Maybe you can become brand soulmates – or at least learn a thing or two. 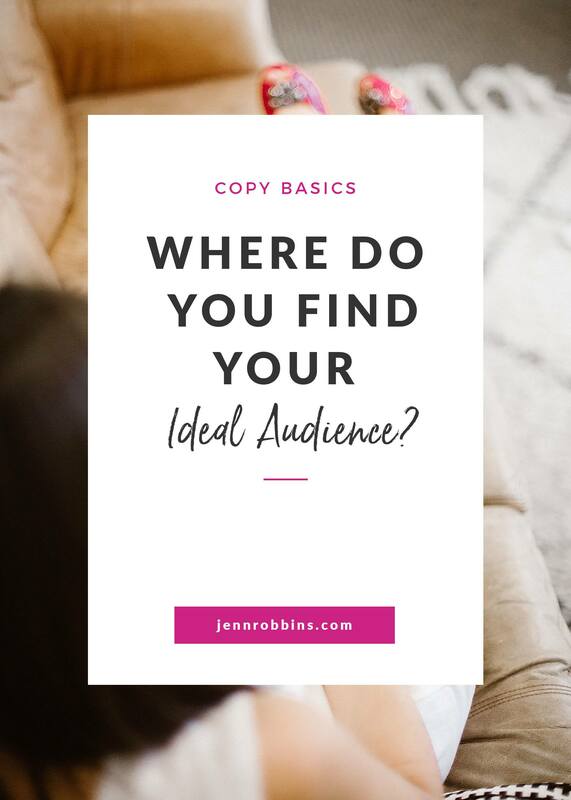 Where Do You Find Your Ideal Audience? It’s easy to get overwhelmed by social media. You focus on your Facebook strategy and then the algorithm changes. You work hard in your Instagram feed and then the format changes. And don’t forget about Twitter, Pinterest, LinkedIn, SnapChat…and there will be something new tomorrow! You can do anything, but you can't do everything. It's exhausting to try to keep up with all the social media. Unless you are a social media manager (or hire one), you won’t be able to do it all. And even social media experts aren’t experts in all the channels! It is simply impossible to know and do it all. You can use any social media you want, but you can't use all of them. There's always going to be a shiny new social media service on the horizon, and it doesn't hurt to try the new ones out. If Facebook Live videos appeal to you, go for it! But if the idea of live video makes your skin crawl, don’t bother. First think about what social media channels YOU enjoy. Where do you spend your time? Which apps do you have to check first thing in the morning? Next, think about what social media channels your Ideal Audience uses. (Not sure who your Ideal Audience is or where they hang out? You need to check out this post.) Are they mostly Facebook people? Do they live for SnapChat filters? Now see where the overlap is. That’s your sweet spot! Those are the channels where you should be. What if they are all EXACTLY the same? That’s ok. Just pick your very favorites. Find what works for you and focus your time and energy there. If you're a photographer, artist, or some other super visual person, then Instagram may be best for you. Able to be super witty in 140 characters or less? Spend your time on Twitter. If you're not sure what works for you or your business, just try a few out. It doesn't hurt to test the waters. But remember: you can’t do everything! If you aren’t getting traction somewhere and you hate having to post there, let it go and move on to something else. Just remember to go where your audience is.